Who Solved the Puzzle? Announcing the Love Sir Grout Facebook Contest Winner Grand Prize and More! If you have been following Sir Grout on Facebook, you probably noticed we held our very first Valentine's Day contest, #LoveSirGrout. It was an exciting and hectic few weeks. Many of our followers started the word hunt with us, constantly looking for the clues on countertops, tiles, and bathrooms, in order to be the first to complete the hidden phrase and win an excellent prize: a FREE full kitchen countertop restoration retailing at $450. In the end, there could only be one winner, and the lucky person was Angela Dorantes Gómez of Washington, DC. Clue #1 was quickly found in the stairs of a lovely home. Some days after that, clue #3 was hidden (and found) among shiny bathroom tiles. The last clue was a little tricky, but a lot of our followers managed to find it, including our lucky winner: Mrs. Angela Dorantes Gómez. She is now getting a free full kitchen countertop restoration, courtesy of Sir Grout. Our Valentine's Day contest was not only fun – we also made a lot of new friends from it, thanks to all the people who shared and liked our posts. We want to thank everyone that participated in our contest. Stay tuned for more surprises in the near future! Join us on Sir Grout Facebook for future discounts, prizes, and more contests! To view the clues and practice your clue-finding skills, check out the Love Sir Grout Contest Page! A full kitchen countertop restoration is an amazing way to give your home a little love, especially for people with stone countertops! Most people don't even know how often they should seal their countertops. In fact, this is one of the most common questions we get from our clients. How often you should seal your stone depends on wear and tear and the quality of your sealer. The more you use the surface, the quicker the sealer will wear. Friction and cleaning fluids reduce sealant life as well. Also, higher quality sealers will last longer. There is a very easy way you can check if it's time to reseal! We recommend doing this every three months to see how well your sealer is performing. Simply take a bit of water and pour it on your stone, then wait a few minutes and see if it's still beading. If the seal is still strong, the water should appear like it would on a freshly waxed car! If it doesn't, it's time to reseal. 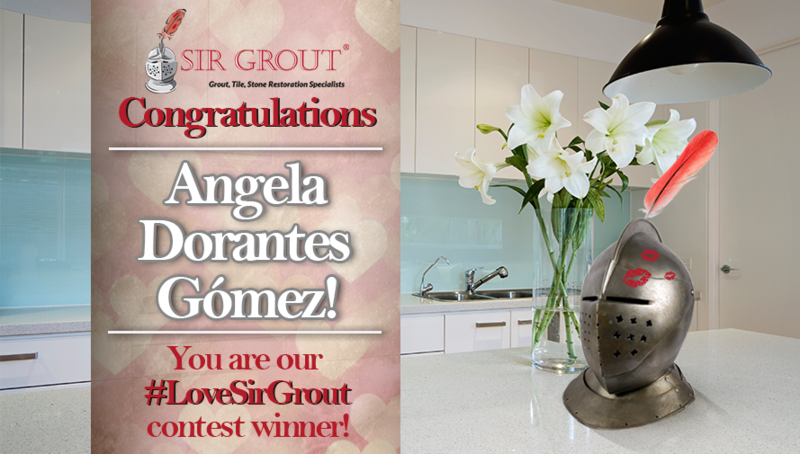 The #LoveSirGrout Contest was a contest run on the Sir Grout Facebook Page from February 1st to February 10th. It was a scavenger hunt where our followers had to look for hidden clues in pictures we posted on our social media pages. Sir Grout is one of the fastest growing hard surface restoration companies around the globe. To find a Sir Grout near you, click on Sir Grout Locations and schedule a free quote with your local Sir Grout franchise today!